Issue 57 - Marx European Theater!! 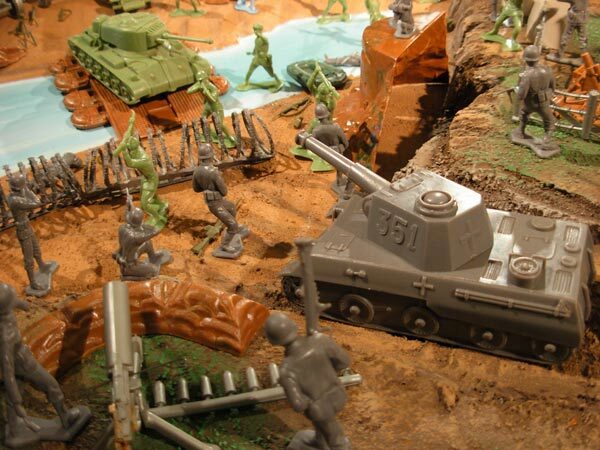 EUROPE WILL BE FREE, FRIENDS -- all the world watches as an invasion of Allies moves towad the coasts of France to begin the liberation not of one city, or county, but the entire continent. Has it ever been done before? No. Will it work? Can all those disparate forces work together to one end? Yes. 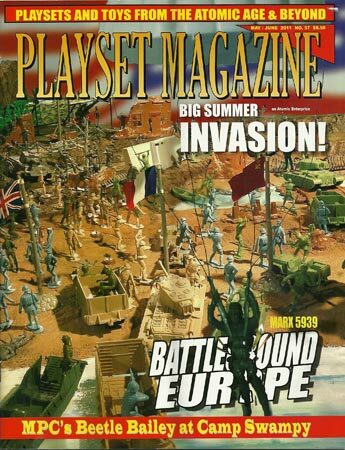 This issue we celebrate the 67th Anniversary of D-Day with the ultimate Marx invasion set, Battleground Europe. New this Issue: Many of you have asked for it - now it's here; the "Basic Training" column which answering many of your questions about collecting: "What's the best way to clean figures?" "How can I preserve my playset boxes?" From making repairs to painting to the latest products - you'll get it all in "Basic Training." And as an added feature, companion videos covering these same subjects, right here at playsetmagazine.com.. The first to episodes have been posted here: Training Center Videos. Also in this action packed issue: Coverage of MPC's Beetle Bailey, a Store Display, a brand new Fort Apache, Payton's Caisson for the Susquicentennial, a Trojans update, as of course, MUCH more!